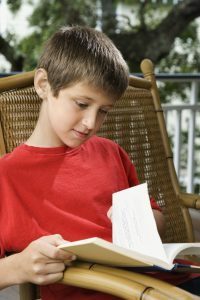 Recently, we discovered a great website, Guys Read, that has excellent recommendations to peak boys’ interest in reading. An obvious, but overlooked idea, is to find interesting material. This website is so helpful! The books are categorized by theme. For example, books that deal with pirates, traveling, robots, and sports are just a few of the topics listed that have been proven successful with boys. It is important that books are Lexile appropriate. A Lexile measures a text’s complexity and suggests a skill level. If you find after picking a few appropriate books that there is still no interest in reading, maybe try encouraging them to read newspapers and magazines instead. Those, too, can receive a Lexile measure. Anybody can be a successful reader; there is no gender requirement!